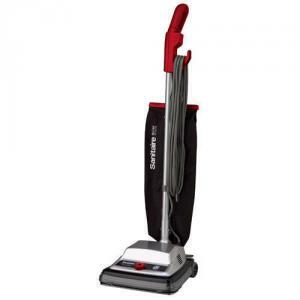 The SC889A Quiet Clean combines the benefits of a conventional upright clean-air system vacuum with synthetic media filtration to provide superb cleaning results. The SC889A is CRI Green Label and LEED certified and features finger tip controls, ergonomic looped handle and easy access dual zipper bag. The SC889A traditional upright model brings with it decades of proven performance with new innovative features such as finger tip controls, ergonomic looped handle and easy access dual zipper bag. Just flip the switch and go from normal to Quiet Clean mode - all without any substantial trade-off in cleaning performance. Now you can use the machine you trust where the cleaning environment calls for peace and quiet. Sanitaire’s Commercial Green Cleaning Line has many models to fit your specific cleaning needs. Select Green Cleaning vacuums have passed rigorous performance tests to earn CRI Green Label™ approval. Sanitaire vacuums are outfitted with a patented filtration system that emits only clean air back into the room. Sanitaire with ARM & HAMMER™ models feature vacuum bags that eliminate odors and capture fine, allergen-sized dust particles. Filtration: Synthetic media filters 95% of allergens down to 0.3 microns. Cleaning Tools: Brush Roll Vibra Groom II, double ball bearing chrome steel with replaceable bristle strips. The Sanitaire with ARM & HAMMER™ line of vacuum bags eliminates odors caused by mold, bacteria and fungi while capturing fine, allergen-sized particles - the ideal combination for the commercial cleaning industry. These bags are available for use with select Green Cleaning models. Sanitaire LEED approved vacuums meet the rigorous specifications of the U.S Green Building Council's LEED program which ensure the finest quality of energy efficiency, air quality and environmental conditions.